So I'll be getting my copy of wrath and installing tonight after work. Looks like I'm way behind with Firelight already dinging 71 as I write this (congrats man). BUT as exiting as the expansion is; what I am waiting for is the start of Season 5 !! I'll keep folks updated with my progress; and as we get closer I'll talk about the new BG's, what to do if your arena partner hasn't dinged 80, gear requirements, etc. 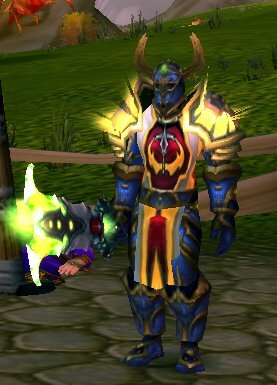 Im leveling my Warrior first, and I am wondering if I should do Prot or Arms arena at 80. Also, grats on the season 4 weapon man. May your giant fly swatter server you well. 32 days. Means one level every ~3 days. 7 bubbles/day. VERY doable for even the casual player. I picked up 3 1/2 on my lunch hour at home. I'm already seeing where it is imperative to logout in an inn if at all possible. Rested XP time may make a huge difference in leveling times - less so for the habitual catassing poopsocker. And grats on 71 - I *might* see that tonight. Level 71 and surrounded by assholes?